This overview describes a trend by large tertiary/quaternary multi-location hospital systems to adopt command centers equipped with new predictive analytics to improve quality, efficiency, and patient outcomes. (Click here for an instant PDF download of this overview). Health systems are unique but have similar challenges. Most face a new normal of more than 90 percent occupancy, resulting from changing demographics, the relative infancy of population health efforts, and little investment in new acute capacity. As a result, major providers worldwide are operating at record-high levels of occupancy and utilization. In this environment, it is increasingly difficult to provide reliably affordable, accessible, efficient, and safe patient care. This manifests in problems such as staff fatigue, declined transfers, ED and PACU boarding, excess days, sub-optimal implementation of pathways, inefficient utilization of staff, and imbalanced resource utilization across the system. Providers have invested in a range of tools to address these challenges: Lean, EMR, electronic bed boards, workflow software, and real-time location systems (RTLS). These tools are important but not sufficient to manage the “new normal” of 90 percent+routine inpatient occupancy. Moreover, a wealth of data being created in IT systems and machines is not being put to work for real-time action. What’s missing is a central node with the information, authority, and wherewithal to anticipate, identify, and resolve bottlenecks, delays, and risk. This node is the healthcare analog to the air traffic control tower or NASA mission control. Having the capability to anticipate, detect, and mitigate risk in real time, command centers complement other performance improvement tools. Command centers are multi-purpose and scalable; they evolve over time like smartphones building on the cultural and technology infrastructure. Manage patient safety and experience, not just bed management or transfers. Include care management and strategy, not just housekeeping and transport. Incorporate predictive and prescriptive decision support tools, not just dashboards from IT systems. Humber River Hospital opened a Command Centre (HRCC) in November 2017. GE designed, implemented, and activated the HRCC as part of an overall transformation program focused on improving quality of care, throughput, access, and cost. Evidence from this proof of concept suggests that healthcare command centers can have significant impact as the centerpiece of an overall efficiency agenda. In addition to real-time action, the JRCC has become a highly visible center of gravity enabling overall efficiency. 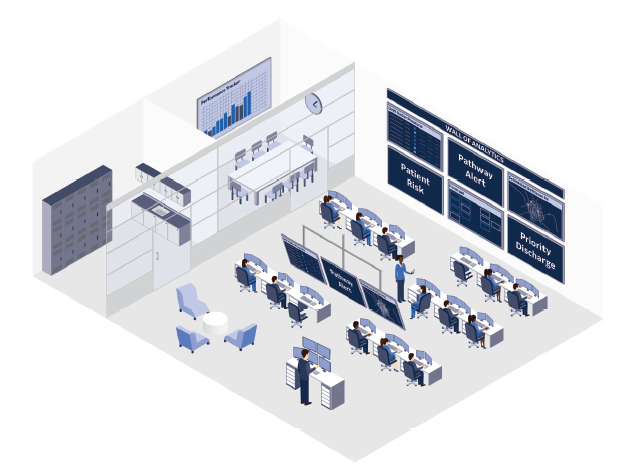 Typically, command centers are the centerpiece of an overall transformation. Transformation starts with discovery and then proceeds in two work-streams: first, reengineer the system using a digital twin to target process improvements and second, design the command center for real-time, all-the-time optimization. GE “tiles” trigger command center staff to act with finely-tuned decision support based on a cross-system data model outside the EMR. A typical command center has 10-20 tiles that stream information within the command center and to staff across the hospital via smartphones, PCs, tablets, and other devices. Command center design begins by crystallizing problems during the discovery phase. The GE team then leads clients through a problem-back design process to develop functional requirements, which may include functions, staff, location and floor plan, source systems, actions, analytics, and a multi-generational plan. Once the design is approved, GE works with the client-selected architect to fully specify and build the space. In parallel, GE builds the Wall of Analytics™ which delivers tiles to users and integrates with the video wall in the command center. GE also works extensively with staff to socialize the concept, plan actions, rehearse, and ultimately activate the command center to deliver impact. GE Healthcare drives the overall program from inception to sustainable outcomes. Patient transfers from other hospitals – Johns Hopkins has seen a 60 percent improvement in the ability to accept patients with complex medical conditions from other hospitals. Emergency Department – Once a decision is made to admit a patient from the Emergency Department, the bed is assigned 30 percent faster. Patients are transferred 26 percent faster after they are assigned a bed. Patient discharges – 21 percent more patients are now discharged before noon, compared to the previous year. Like every command center, the JRCC is expanding to tackle new problems for patients, families and caregivers. The scope has already expanded to throughput and the team is planning to address clinical outcomes and cost. The command centers described here are different from the many existing transfer centers, bed management centers and resource centers. Leading providers with these legacy smaller centers are already replacing them with command centers. These new centers are multi-purpose and scalable. They manage patients into, through and out of the hospital. They manage patient safety and experience, not just bed management or transfers. They include care management and strategy not just housekeeping and transport. They also incorporate predictive and prescriptive decision support tools, not just dashboards from IT systems.